The Little Black Book of Leadership - a book review - Eric D. Brown, D.Sc. 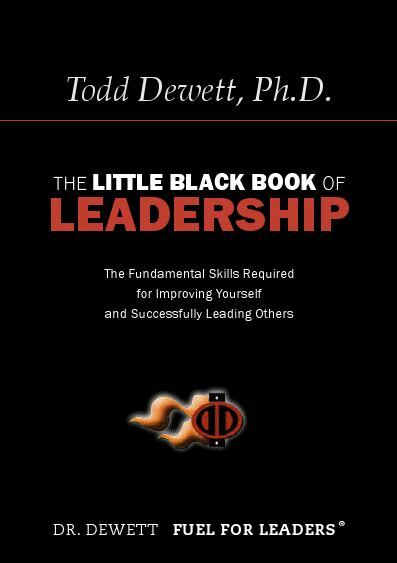 Last week the author of The Little Black Book of Leadership, Todd Dewett Ph.D., contacted me to say hello, complement me on my work here and offer up an electronic copy of his book. I receive variants of this type of email quite often. Most are from agents and PR folks trying to get a review of their clients book. I’ve started stepping back from accepting offers of books to review, mainly due to time constraints on my side. So, normally, when i receive these types of emails, I polity decline. But…this time…I couldn’t decline. 1.) Todd made the note personal. 2.) Todd made the note about me and not his book. 3.) Todd included a funny little photo (see below photo) that caught my eye and got me interested in learning more about him, his services and his book. So…I promptly said I’d take a look at the book. I’m boy am I glad I did. While scanning the book, I saw a passage that jumped out at me…and caused me to stop scanning and start reading. It is a big lie that “managers” and “leaders” are different things! Managers deal with the present. Leaders deal with the future. Simple statement but powerful. Think about all the commentary out there in acadamia, the interwebz and in books about ‘leadership’ vs ‘management’. Sure…the concepts are different….but at the end of the day, a good leader is one who can manage well…and vice versa….or at least it should be that way. I’ve known good ‘managers’ who couldn’t lead their teams to save their lives. I’ve also known good ‘leaders’ who could get people focused and moving in the right direction…but the most successful people I know are those who could do both roles at the same time. They can lead and manage extremely well. I read through the book twice….once while scanning and again with more focus on the content and I have to say this is a pretty darn good little book. Is there anything in the book that’s groundbreaking? Nope. Nothing new either….but the way that Dr. Dewett presents the material is golden. This book isn’t something you read once and put on the shelf…its a checklist and reference guide combined. Its something that you can use at any stage of your career to become a great leader. The book has some great little nuggets of knowledge that will make it worth your time. Check out Todd’s Fuel for Leaders website and pick up a copy of his book in his shop. I think you’ll be happy you did,. Thanks for this book review. 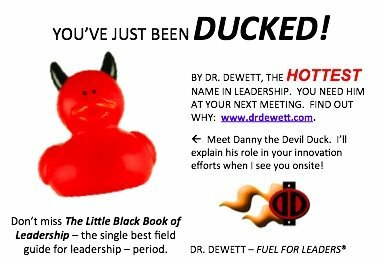 I think I respond better to checklists so I’ll be on the lookout for The Little Black Book of Leadership. 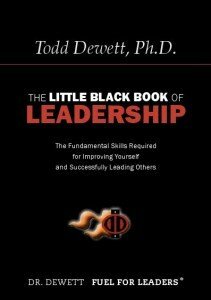 A great IT blogger reviewed my book The Little Black Book of Leadership, check it out: http://tinyurl.com/5tpprdk. Thx Eric!